Knowledge and the Probation Service is designed to help trainee probation officers study for the Diploma in Probation Studies, focusing particularly on the NVQ elements and making the link to the degree programme in probation. Written by Philip Whitehead and Jamie Thompson, each with over 25 years’ experience of the probation service, it will also be valuable to those assessing and managing trainees. Opening with an historical overview of training in probation, the book moves on to examine key aspects of the NVQ: report writing, information for Practice Development Assessors, how to put training into practice once qualified, and how to progress beyond the codification of knowledge to achieving vocational excellence as a probation officer. Timely and relevant, Knowledge and the Probation Service will stimulate and motivate trainees, offer food for thought for those involved in the planning and development of probation training, and will contribute to the wider debate about the nature of probation identity in these changing times for the service. Philip Whitehead has worked for the Teesside Probation Service since 1981. He has published several books and articles in relation to probation, community supervision of offenders, temporary release schemes and reconviction, and managing the probation service. Since 2001 he has been working as Senior Practice Development Assessor, which involves teaching and coaching trainees undertaking the Diploma in Probation Studies to prepare them to work as probation officers. Jamie Thompson worked for Northumbria Probation Service for 19 years. He has been involved in the training of probation officers as a practice teacher, training manager and joint appointment. He was course leader for the probation degree and coordinating Internal Verifier for the Community Justice NVQ Assessment Centre at Northumbria University. He is currently Principal Lecturer and Learning and Teaching Coordinator and a joint manager of the Community Safety Research Unit. He is an active researcher and has published in relation to probation, community safety, and teaching and learning issues. 1. Training and knowledge in probation: A historical overview. Introduction; Emergence of probation; Training in the early years; The need for training gathers pace; The first Home Office Training Scheme; Casework in probation; The 1940s and beyond; The implications of empirical research; Towards the present; From generic to specialised training in the 1990s; Conclusion; Summary; Further reading. 2. Knowledge in vocational education. Towards an understanding of change; Knowledge and competence; The knowledge economy; Theory and practice: Knowledge for work; From codification to learning; Feelings: Last but not least; Summary; Further reading. 3. The Diploma in Probation Studies. Introduction; Occupational Standards; NVQs; PDAs; Assessment and knowledge; Analysing the knowledge requirements; Summary; Further reading. 4. Knowledge resources for trainees: Help with the NVQ. Introduction; Victims; Explaining offending behaviour: The search for patterns; The probation service and legislation 1861–2001; Local area policies and guidelines; Professional values; Risk assessment; Effective practice/methods of working; Communication; Enforcement and compliance; Self-reflection and personal development; Confidentiality; Conclusion; Summary. 5. Knowledge resources for trainees: Writing quality Pre-Sentence Reports. Introduction; Rationale; Defining quality; Process; Content of PSRs; Key features in report writing; Reports and race; The sentencing framework; Implications for reports: Points to emphasise; Nil reports; Conclusion; Summary of available sentences; Additional requirements; Strategy for learning how to write reports; Summary; Further reading. 6. The Practice Development Assessor: Producing quality probation officers. Introduction; The role of the PDA; NVQ Assessor; Internal Verifier; Three PDA models; Reflections on the role; Knowledge as a multifaceted concept; Knowledge typology for probation practice; Elements of a training strategy; Conclusion: Further reflections on the NVQ; Summary; Further reading. 7. Being a probation officer. Introduction; Continuing professional development; Learning in practice; Emotional development; Personal values; Probation values; Being a probation officer; Summary; Further reading. 8. From competence to excellence: Going beyond the codification of knowledge. Summary of Chapters 1–7; Going beyond minimum knowledge requirements; Threats to knowledge; The PDA–TPO dynamic; Suggestions for further improvements; Final comments; Summary. 1. Influences that have shaped five key phases of probation history . 2. Criminological perspectives: Help for practitioners. 3. Client or offender: The labelling perspective. 4. Joining loose wires to make connections: Developing practice awareness. 5. Methods of working with offenders. 6. Differentiating the ‘what’ from the ‘how’ of practice. Author team have over 40 years of combined experience working in the probation service and have written extensively on the subject. 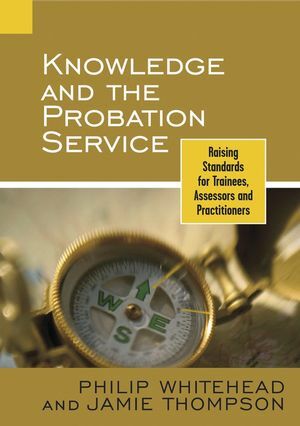 This is the first core textbook written specifically for probation officers and their trainees.